Beginning with New Year's Day and going throughout the year to the winter holidays, lesson plans with themes based on the holidays are effective tools for teaching students about their culture as well as those of others. Whether students are in preschool or high school, holiday themes can enhance a lesson. For instance, when students learn the history behind a particular celebration, they become more aware of why that day is special. In addition, they can write about it (Write a story about your best Fourth of July), use elements of it in math (How many pumpkins are in the pumpkin patch? ), as well as use the ideas as a springboard for science studies (What happens in the winter when the days get shorter?). Note: It's important to recognize that many holidays observed in the US today were once holy days. Sensitivity to students' individual cultures and beliefs is imperative when teaching lessons about cultural celebrations. January and February are packed with legal holidays that celebrate famous Americans such as Martin Luther King, George Washington and Abraham Lincoln. In addition, Valentine's Day is one of the first of several holy days that has morphed into a civil observance. Lesson plans based on these days can touch upon topics such as civil rights, freedom, the Revolutionary and Civil Wars, compassion for others, and ways to show love and appreciation. Spring, the season of rebirth, has several holidays that can easily be part of a lesson plan. St. Patrick's Day, the Spring Equinox, April Fool's Day, and Earth Day provide opportunities to teach students about topics such as the Irish culture in America, observances of rebirth and growth, the benefits of humor and the need to care for the Earth. In addition the feasts of Easter and Passover are usually observed during these months. Beginning with May Day and ending with the Summer Solstice, the months of May and June provide ample opportunity to create lessons based on holidays. Students can learn the origins of May Day; discover the culture behind Cinco de Mayo; celebrate Mother's Day, which was originally called Mothers Peace Day; learn about the sacrifices made by veterans, while learning the history of Memorial Day; delve into the origins of the American flag; honor fatherhood; and joyously welcome the coming of summer. Most children are on vacation during July and August, but many attend summer schools or camps. Lessons on holidays during July and August might include the history, traditions and rituals of Independence Day. If the students are at a camp setting, lessons on National S'mores Day are sure to be a hit. The school year usually begins just before or after Labor Day. Lesson plans for the first weeks of school might introduces students to some of the history of labor laws in the U.S. Patriot Day and the observance of Rosh Hashanah are two other days that can inspire lesson plans. During October, lessons on the discovery of America, Yom Kippur, United Nations Day and Halloween will give students hours of exploration into their world and culture. Lesson plans for November and December have covered the topics of harvest, the Pilgrims, and the various celebrations of the winter season. Educators may want to include Veteran's Day. 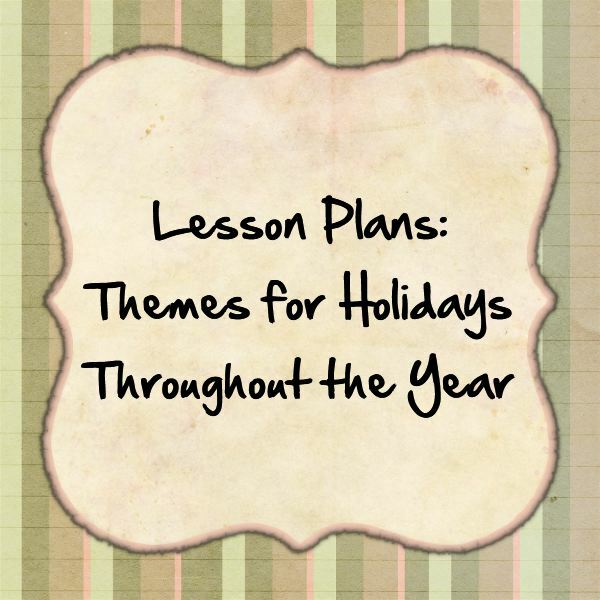 Having ideas for lesson plans that relate to the various holidays celebrated throughout the year imparts a wealth of knowledge in history, language arts, science and math as well as culture and customs. Holiday-themed lesson plans capture the attention of students of all ages, engaging them in curriculum that is enjoyable and informative.